Watch: This Dancing Video Of The Bride On ‘Kala Chashma & London Thumakda’ Has Gone Viral Like A Wildfire! There’s no doubt that weddings are all about dancing, eating and making merry. The duration of weddings varies from families to families. Some prefer hosting a week long wedding while some love to keep it short and sweet. The whole affair that lasts a few days in most celebrations is definitely less about the rituals and more about never-ending fun. All the family members and friends have a blast with all those never-ending rituals. 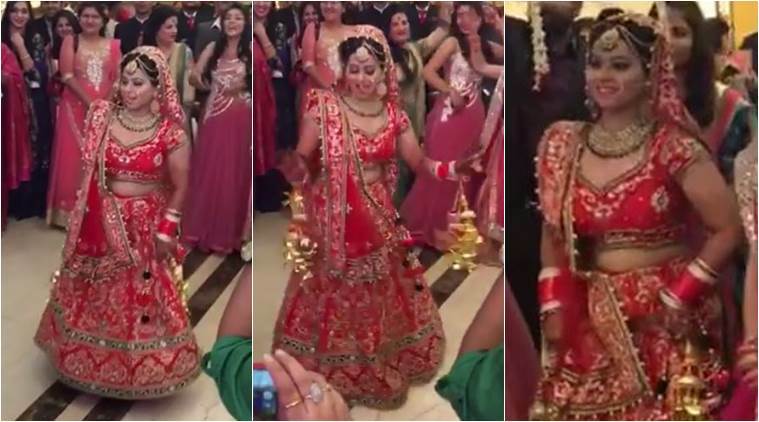 Yes, the video of her dance has gone super-viral and you will enjoy watching it. A facebook user named “Sagar Arora” has posted 2 clips of hers and since then, the internet users have gone crazy. Within three days, the total views have crossed 15 million, isn’t that awesome? 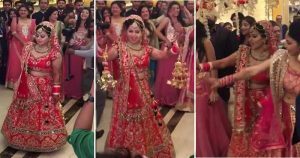 In the video, the bridemaids dance with her while others around look happily shocked at her courage. While a lot of brides choose unique entries like riding a bike to the mandap or coming on a rikshaw, this one stands out for her outstanding dancing skills. So guys’ how did you find this dance? Let us know your views in our comments section below.